We are on our last Football Friday of 2017. Where did the year go?!?! I hope everyone has a safe New Year! We will be at home watching all the football games. 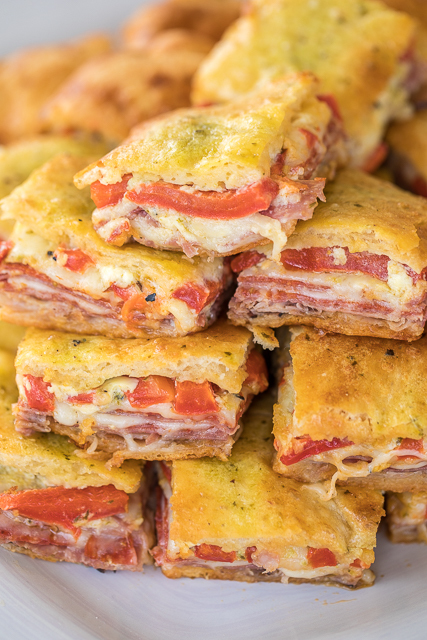 We will also be snacking on these Antipasto Squares. They are ridiculously good!!! 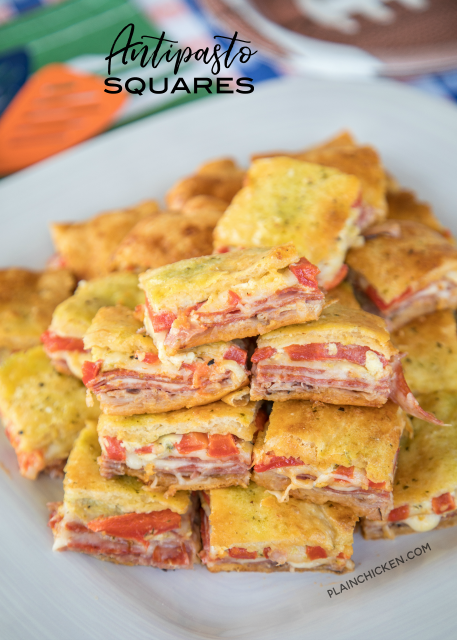 We had a version of these Antipasto Squares at a friend's house earlier in the year. I LOVED them!! It was almost embarrassing how many of these delicious squares I ate. ALMOST! LOL! I immediately went home and started researching recipes so I could make them myself. 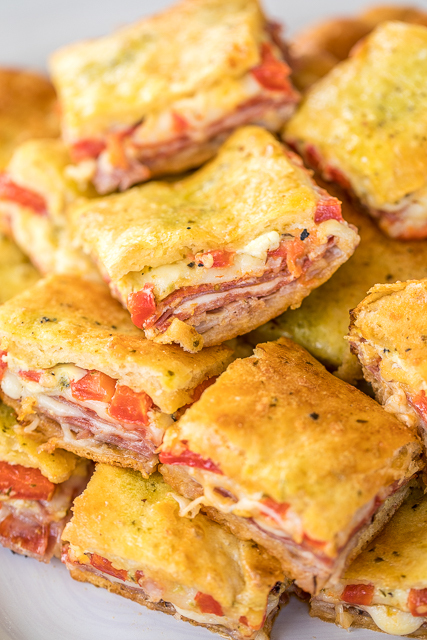 These Antipasto Squares are crescent rolls stuffed with ham, salami, pepperoni, provolone, swiss, and roasted red peppers. The crescent rolls are topped with a parmesan cheese, egg and pesto mixture and then baked. Let me tell you, these things are SO good! Perfect for tailgating or any New Year's parties you have going on this weekend. They taste great hot out of the oven or cooled to room temperature. I promise there won't be any leftovers! Just a note - Feel free to leave out the roasted red peppers if you have picky eaters. They taste just as good without the peppers. Unroll one package of refrigerated crescent roll and press into bottom of prepared pan. Layer ham, swiss cheese, salami, provolone cheese, pepperoni, and red peppers, on top of the dough. Unroll second can of refrigerated crescent rolls, and place on top of peppers. Press seams to seal. Whisk together eggs, parmesan cheese and pesto. Pour over crescent rolls. Cover pan with aluminum foil. Bake, covered, for 30 minutes. Uncover and bake an additional 15 to 20 minutes. Cut into squares. We love football in this house. I have collected all of your Friday Football recipes, haven't tried them all yet but the ones I have are excellent. Go Ohio State Buckeyes, Bengals and U of Cincinnati. I say crescent rolls or crescent sheet for the ingredients. The sheets are definitely easier if you can find them. Can these be made ahead (several hours or a full day)? What would be the best way to store and reheat-oven or microwave? They look wonderful! You can make them ahead - I think a in advance would be fine. I would refrigerate them and either reheat in the oven or microwave. I usually prefer to reheat in the oven, but either would work great. I made these yesterday for a cocktail party. BUT the foil stuck to the top and I could not remove it after the 30 minutes. I left it on till the end of cooking then had to peel it off taking part of the top dough with it! Still tasted good but not so pretty! You could also spray the foil with non-stick spray if you don't have nonstick foil. Yes, they are good at room temperature. You should actually serve them after they have cooled a bit because they can be runny if too hot. These are to die for. I always make them for family gatherings and they disappear fast! My recipe did not have the basil pesto in it, so I will definitely try that next time. I do use the crescent sheets when I can find them- otherwise pinch together the seams in the original crescent rolls. Also have used with garlic flavored crescent rolls- delicious! I want to take these to a party. do they get soggy after awile? Anybody know? They don't get soggy - I've taken them to parties and they do just fine.